Mission Statement – To honor the service and sacrifices of our country’s veterans, to foster appreciation and promote knowledge of our country’s history, our mission is to collect and preserve memorabilia and books of the military history of the United States with special emphasis on veterans and their families of the San Ramon Valley. 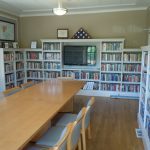 Paolini Library – Colonel Mario G. Paolini, USA, Air Defense Artillery Corps, WWII, collected and cataloged an extensive library relating to military history (5,000+ books) over his years of military service and into retirement. 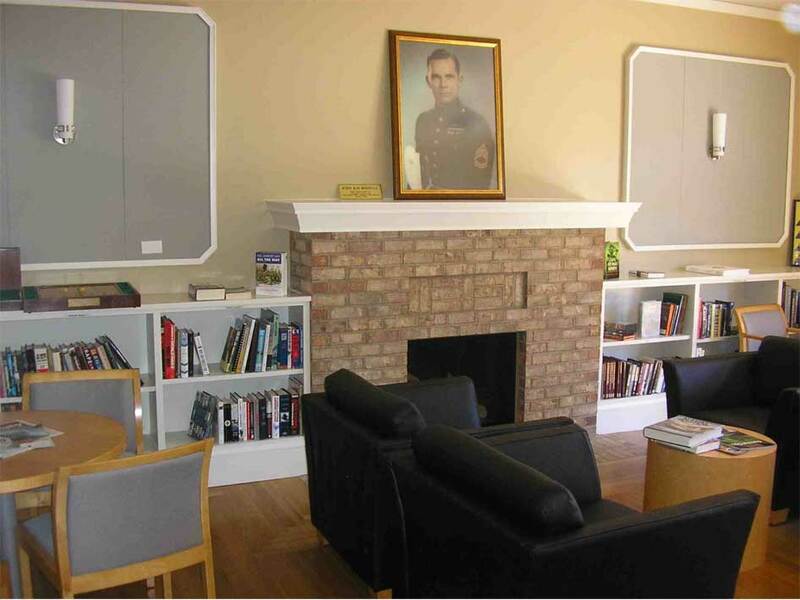 The Library was donated by his family to Marine Corps League Detachment 942. It has made a portion of the collection available for public enrichment and research purposes in the VMB Gorman Boardroom and Library. Presently, the books in the bookcases relate to WWII. Please note that the library does not allow the books to be taken out of the premises, but browsing is encouraged. Click here for a complete list of all books in the Paolini Library. Docent Program – volunteer docent program is available Monday through Friday from 9:00 a.m. to 3:00 p.m. Veteran docents are available to guide the visitors through the collection of military memorabilia on display and share their history of military service. The program is led by Art Gaskins, our very own special WWII veteran. Anyone interested in serving as a docent is encouraged to visit the building during business hours. For more information contact info@vmbsrv.org or call 925.362.9806. Memorabilia Donation Policy – True to our mission, we continue to seek items illustrating the military history of the United States with particular emphasis on the service of our San Ramon Valley veterans, past and present.To enable our Library and Historical Collections staff to properly review and evaluate proposed donations beforehand, please do not “drop off” any items at the Veterans Memorial Building. Those who have suitable items for possible donation or loan should first document those items on our donor form available from the docents or by contacting info@vmbsrv.org. Decision on acceptance will be made by the Collection Committee and the donor will be contacted. Note from the Veterans Memorial Building Museum Curator: We are proud to display our special collection of items reflecting the military history of the United States. Memorabilia that specifically relates to local San Ramon Valley veterans are our particular, chartered focus. However our display space is very limited and we cannot display all of our items, even on a temporary basis. We must also refrain from accepting items into simple storage that may not likely be displayed in the future.As a consequence, we regret that we are no longer able to accept offers of service uniforms as these may also incur a substantial packaging and preservation cost. Your support and understanding are greatly appreciated. © 2019. Veterans Memorial Building of San Ramon Valley. All rights reserved.